…This three-part video series will analyze how to optimize vision, tracking, and timing. 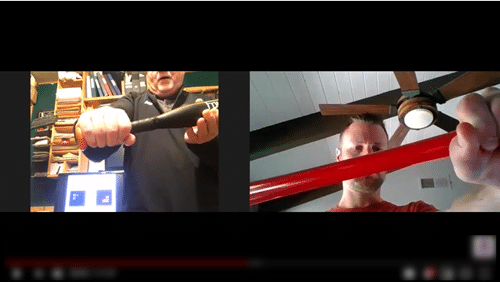 This Part-1 video, featuring Mike Trout, will be unwrapping how the best mechanics in the world mean nothing without proper vision. In this game, we live and die by how consistent we are. CLICK HERE for an interesting academic study on six elite female shot putters. Results found head movement during rotation can influence the movements of the limbs and trunk. 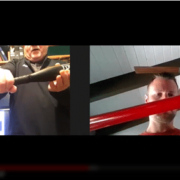 The professional hitter in the study was right handed. 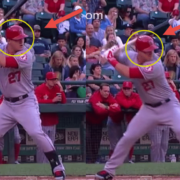 What’s interesting with hitters like Mike Trout, is that they have to use a bit of head and eye movement when tracking the incoming pitch. Not one or the other. However, nobody on earth, EVER, has been proven to keep both eyes on a pitched ball continuously to home plate. In the study, A. Terry Bahill said, in order to do that, the ball would have to be traveling at around 25-mph, in which case, it would NEVER reach home plate in softball or baseball. Olympic throwers move their heads forward (including Javelin, Discus, and Hammer). Lacrosse players do too. And so do Pitchers! 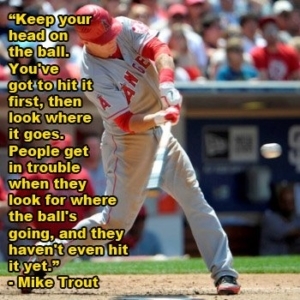 For a hitter like Mike Trout, forward head movement, dropping the “eye-line”, are okay…until landing. I say, get head movement out of the way early. Mike Trout does strikeout quite a bit, which may be attributed to the dropping eye line. The hitter told to “Sit back”, keeps the head still early, but moves it after the landing position and during the Final Turn. This is not good for improving consistency. Maintain a moderate swing tempo and relax the jaw (not over-swinging).